The exercise professional with expertise in the training of special populations (via formal education and professional certifications) is properly positioned to meet the growing need for professionals with appropriate background in this area. Joint replacement surgery (also known as arthroplasty) involves replacement of part (e.g., articular cartilage) or all of a damaged or arthritic joint with a metal, plastic, or ceramic prosthesis in order to return the joint to normal pain-free movement. Mrs. P is a receptionist in a dental office. Her job entails sitting for long periods of time, entering information into a computer, and retrieving dental records. 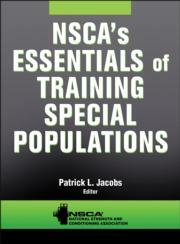 NSCA's Essentials of Training Special Populations is an ideal preparatory guide for those seeking CSPS certification. The book is also a practical reference for exercise professionals who work with clients with various conditions and disorders.